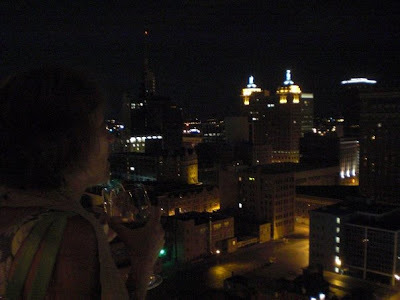 Here I am last night looking over the Buffalo skyline. What about the Skyline Inn? Remember when I met Leonard Pennario's decorator there? What about "Skyline Pigeon"? That is an Elton John song that I like. Though I would never have told Pennario that. You did not mention to Pennario that you liked Elton John. He would not have wanted to hear that unless he was sure you were teasing. Here is Elton John old and singing "Skyline Pigeon." He sounds as if he has had a few beers. Here he is admitting that. Wow! The videographer had a few beers too. Ay me! I am getting distracted! Back to the Buffalo skyline. Lastnight Howard and I got to go downtown and watch the lighting up of Avant. That is our new skyscraper! Well, not ours. Our building is Big Blue which is across the street and is somewhat more modest. The Buffalo skyline is the world's greatest skyline. It has so many wonderful features. We have the Electric Tower. Isn't that stunning? That is a picture taken in 1932 but it looks the same way now. Pennario lived in Buffalo when that picture was taken! He would have been 8. My friend Lisa who is married to my old roommate Daryle says that it looks like Mormon church. But it does not! Mormon churches look like our Electric Tower, is the real situation. 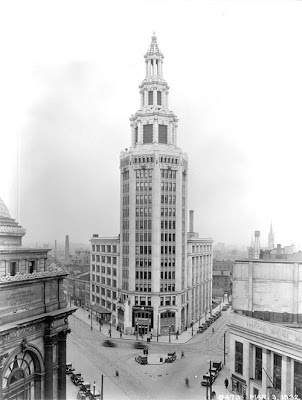 Our Electric Tower was designed by August Esenwein who was a German count. In Buffalo we have buildings designed by German counts! That is something to fling in people's faces if they insult our town, not that I can imagine anyone doing that. Also we have St. Michael's Church where I went back to Confession after 20 years. That was a wonderful and exciting and mystical day! I never look at that church without thinking of that and it always makes me smile. And one of my favorite buildings in the world is our Liberty Building, with those beautiful statues of Lady Liberty that light up golden at night. That, and we have that magnificent City Hall with its Art Deco Indian tower. Those are all beautiful and unusual features. And lastnight I took them all in with a glass of red wine in one hand and a glass of apricot champagne in the other. Which, that is the way I want to exit the earth when it is time to go. Luckily it was not time to go last night! Howard worried that it might be. He did not trust the balconies the way I did. He was hesitant and ginger as he approached the railing. Luckily everything turned out fine. We toasted the Buffalo skyline and lived to tell the tale! In the right background of the Electric building photo can be seen the steeple of the late lamented St. Mary's (named after you?) Church at Broadway & Pine Sts. So glad you guys survived! Really? One in each hand? And... Elton... well, that would not have been as bad as say, The Grateful Dead, if you had told Leonard. I suspect.